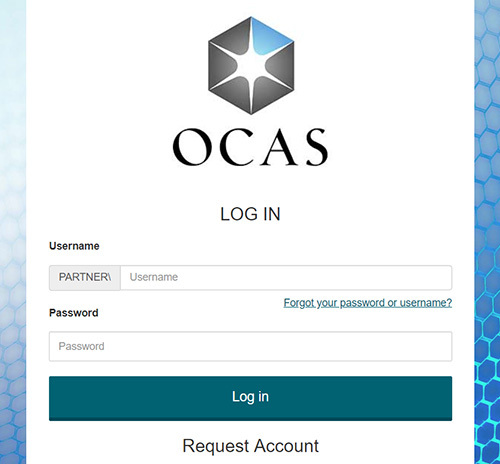 During the onboarding process for each college, OCAS creates International Portal accounts for college staff and international reps, and will provide all usernames and passwords. If you wish to create a new International Portal account for someone at your college, please contact us. If you've forgotten your password, click the Forgot Password link on the login page. If you need help or wish to deactivate an existing account, please contact us. International College Portal User Guide (.pdf) – Coming soon! How do I access the International College Portal? On the OCAS website, click the Log In / Register button in the top navigation, then click International Portal Login. Who can create new International Portal accounts? New International Portal accounts are created by OCAS, as requested by a college. If you wish to create a new account, please contact us. Can International Portal accounts be deleted? If you wish to delete an International Portal account, please contact us. For agencies that are active in the system, at least one Agency Manager account must be defined for that agency in order for the agency account to be deleted. Will my access to the OCAS Partner Portal change? Currently, members of your college staff have access to the OCAS Partner Portal to manage domestic applications. They're able to view paid applications to your college, as well as manage your college's program catalogue (add, close and waitlist programs), electronic transcript requests, and acceptance confirmation messaging. If your college has staff who will handle both domestic and international applicants, they will be able to use the same Partner Portal functions as they can today. What is a college representative? A college representative (or college rep) is an employee of the college. College reps have Partner Portal accounts and will also be able to log into the International College Portal. They have access to a more limited set of features and options compared to other college users. Which applications can a college rep view / access? College rep users have view only access for applications created by agents or direct applicant from their assigned country. What actions can a college rep perform on an application? If the college representative is the creator of the application on behalf of a student, they will be able to view and edit the applicant's profile (including supporting documents) and application status. Actions related to accepting or declining offers, or withdrawing an acceptance are only available to the agent or applicant. If the college rep conducts any type of pre-screening, they will also have the ability to use the Screening Complete or Needs More Information flags. Can a college rep change an applicant's personal information? A college rep user cannot change an applicant’s personal info, unless the college rep user created that applicant. The reason for this is that the applicant’s profile is shared with multiple colleges and one college cannot be allowed to make changes that could impact another college. Only agents / applicants can make changes to their profile. Can a college rep make admissions related decisions? No, a college rep cannot make any admissions related decisions, including issuing, declining or revoking an offer. What do the different agent statuses mean? Active – the agent is active in the portal and can submit applications. Applicants can select this this agent when creating their application. Inactive – the agent cannot submit applications and applicants cannot select this agent within the application. Probation – used to indicate that the agency agreement may have expired and requires renewal. The agent can still submit applications and applicants can still select this agent within the application. Suspended – the agent does not have access to the portal and will be forced to migrate their applications to another agent at the agency. Applicants cannot select this agent within the application. If you are attempting to set an agency to inactive or suspended, all draft applications will be deleted and any open applications must first be reviewed and actioned (i.e., declined or withdrawn / closed). How do agency fee waivers by country work? Agency fee waivers by country are based on the applicant's country of citizenship. If an applicant is not a citizen of the country for which you have chosen to apply a fee waiver, their application fee will not be waived. 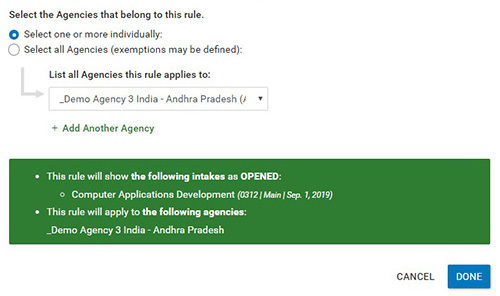 For example, if your college has a fee waiver for agents in India, only applicants who are citizens of India can have their applicant fee waived. Applicants who live in India, but are citizens of another country, will not be eligible for the fee waiver. How do I change to the selected agency within an application? 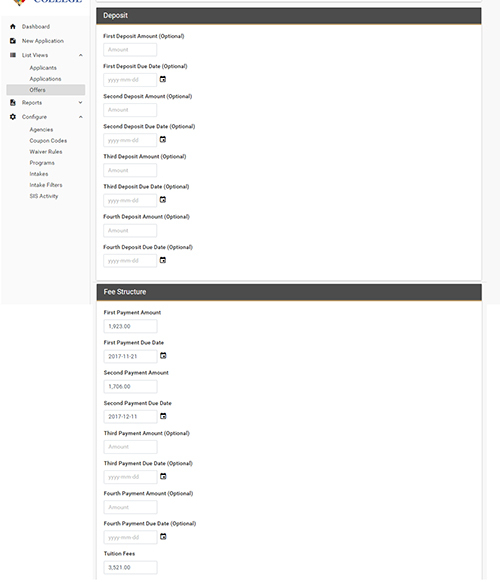 Create a duplicate applicant in the system with all the same information and assign them to the new agency. Make any program selection on the applicant's behalf. What is the difference between an Applicant ID and an Application ID? When an applicant profile is created, an Applicant ID will be assigned to that applicant. After an applicant profile is created, the next steps include the creation of an application. Once an application to a college is created, then an Application ID is assigned to that application. Will a Student ID be created after an application is submitted? If a college's Student Information System (SIS) is linked to the OCAS International Application Service (IAS) through SIS Integration, a Student ID will be sent from the college's system on submission of an application and will appear on any offers issued to that applicant. If a college's SIS is not linked to the OCAS IAS via SIS Integration, no Student ID will be passed back from the college and the Applicant ID will be used to populate the offer letter. Do applicants receive notifications when Applicant Notes are added? No, applicants will not receive a notification when an Applicant Note is added to their application. Applicant notes are used for communication between college users only, and are not be visible to applicants, college reps, or agents. What is a ranking change? 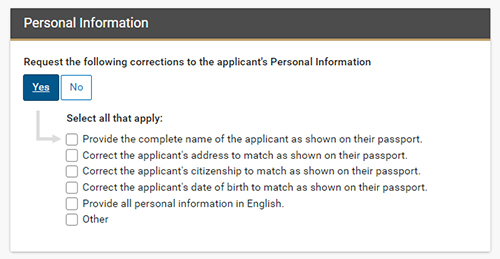 Similar to the domestic application, applicants may change the order of their program selections (also known as ranking). An application can have up to 3 program selections ranked in order from 1 to 3. When an applicant moves a program selection up or down in rank, it's referred to as a ranking change. What should I do if an applicant's payment is cancelled after submission? If an application is submitted directly by an application (without an agency), the Review Application page will show if the payment of the application fee was cancelled after submission. You can process the application without collecting the fee, then close the application and email the applicant to let them know their payment was not received. The applicant will need to create a new application and pay the application fee using one of the available options. This process should be fairly quick, as all of the applicant's profile details (personal information, education and supporting documents) can be carried forward from the previous application. If an applicant has not accepted an offer / paid before the deadline, should their application be closed? If there is no further action on other program decisions, the application should be set to Closed status. In what instances would an application be closed? If you are no longer processing an application and no longer need to track the applicant in the College Portal, the application can be set to Closed. What access does an applicant have once their application is closed? The applicant (and agent, if applicable) will see that the application is closed and the last offer state, however, they cannot make any further program decisions. The applicant may edit their profile and submit a new application to your college. How do I track applicants that are waitlisted? Under List Applications, select the Waitlisted state to view a list of applicants who are waitlisted, as well as the date this took effect. Do applicants receive a notification when an offer is revoked? Currently, applicants do not receive a notification when an offer is revoked. We're working to include this feature in an upcoming release. 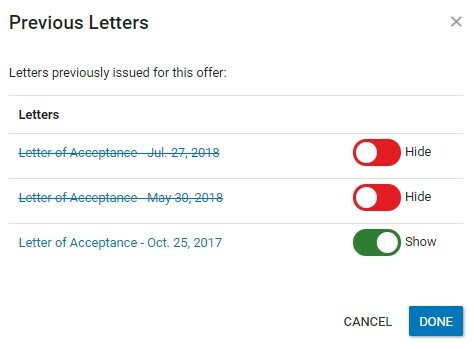 Do applicants receive a notification when an offer is closed? Currently, there is no Closed state for offers. The applicant / agent will receive a Letter of Acceptance with a disclaimer that states it cannot be used for visa purposes. This allows the applicant to begin financial preparations to attend college, such as applying for a bank loan, but they may not yet apply for a study permit / visa. Pre-admits may also be used to indicate conditions the applicant must meet before they can receive an offer of admission. Applications in the Pre-Admitted state can be tracked under List Applications. The latest updates to the International Application Service in one place. New program search for agencies will reduce the number of abandoned applications by allowing agents to check program availability by term and college before starting an application. Making English proficiency test score and supporting documents mandatory for applicants and agents who indicate they have completed an English Proficiency Test will improve the quality of applications. New screening failed option for College Reps and Admissions Officers will increase the flexibility of screening processes by providing the ability to close applications and decline all program selections at the screening stage. 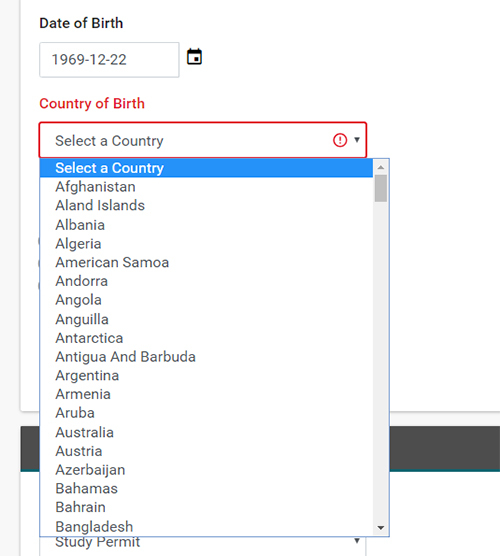 New personal information flag will improve the visibility of applicants whose country of residency differs from their primary country of citizenship, ensuring these applicants can be easily identified for unique processing. New ‘Resolved’ status for additional information requests will enable applications to be processed more efficiently by allowing College users to mark requests as ‘Resolved’, for example when information has been provided outside the IAS or a request has been re-issued. Enhanced assignment of applications to College Reps will make it easier to manage the visibility of applications for one or more College Reps.
New college users page will provide greater transparency of the roles, and associated access, provided to different team members by allowing College Reps to see their assigned country(s) or province(s) and College Super Users to see all users. Enhanced log in experience for the College Portal will enable users to recover a forgotten password or username and request an account by clicking the new links on the log in page. Additional co-op work internship options will improve the clarity of offers by introducing Internship Required, Industry Placement Required and Field Placement Required selections. Alignment of offer revoked and acceptance withdrawn reasons with visa / study permit status will provide more consistent tracking and reporting of offers. Addition of program code to program selection page will help applicants and agents better distinguish between programs with similar or identical program names. Enhanced reporting through a new College Rep performance report for College Super Users and Rep Managers, to better manage the performance of in-country College Reps, a new Agency Details report for College Super Users, to better manage their agency information, and the addition of current country and province of residency fields to all reports to provide greater visibility of applicants’ current residency. New multi-level screening options will increase the flexibility of screening processes by adding initial, secondary and final screening steps, with the option to send application data to Student Information Systems (SIS) when final screening is complete. 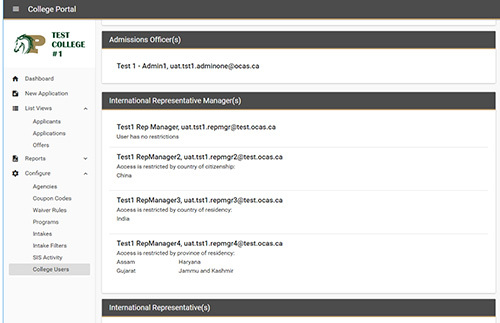 In-Country Reps can now be provided with access to applications based on the applicant’s country(s) or province(s) of residency, which is particularly useful for colleges with multiple reps in large markets that need more granular controls and permissions. Rep Managers now have a new role with similar permissions to In-Country Reps, with additional permissions to modify the agency assigned to an application, assign an application to another College Rep, grant an applicant access to their application, and generate the College Rep Performance Report. 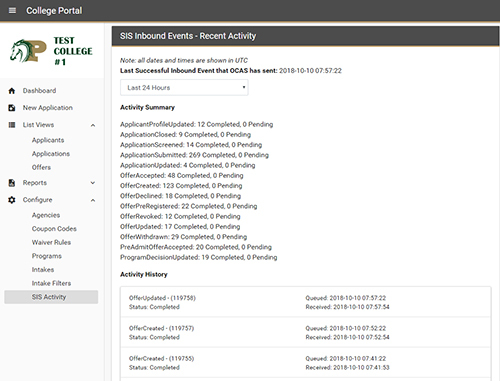 Enhanced SIS integration events will provide more integration options for colleges by providing the ability to download supporting documents, offer letters, pre-admit letters and payment receipts for any application, including those in Draft state, directly to their SIS. Further, to help process applications more efficiently, additional fields have been introduced to include a direct link / URL to the application in OCAS IAS and indicate the applicant’s level of English Proficiency at the time they submitted their application. Colleges only receive paid applications. Colleges will now only receive applications after the application fee payment has been confirmed by Flywire. New email notifications for applicants and agents. Applicants and agents are now better informed throughout the application fee payment process through new email notifications at key milestones. Retrying failed payments. In the event a payment fails, applicants and agents will now have greater flexibility to retry the payment. Enhancements to the Applicant Profile for colleges. 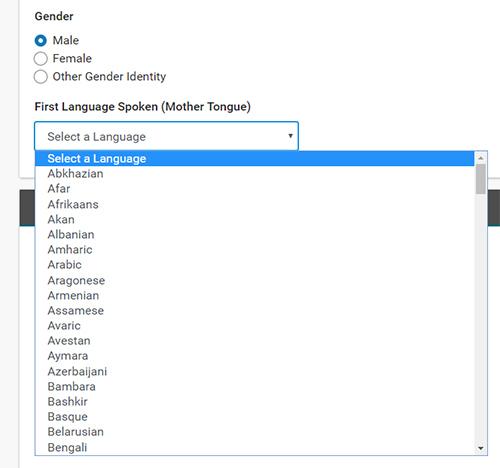 To help ensure colleges are able to report on international student information as per Ministry guidelines, we’ve added new Country of Birth and First Language (Mother Tongue) fields to the Applicant Profile. Enhancements to the application review process for Admissions officers. Requests for additional information. 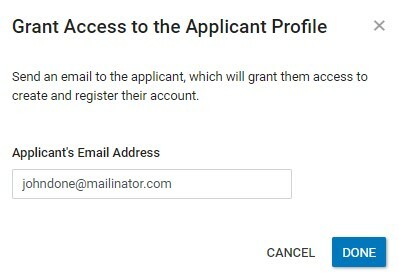 To make it more efficient for colleges to request additional information on an application, we’ve created pre-defined lists with the flexibility to enter custom requests. New supporting document type. To help colleges confidently and efficiently process deposit and tuition payments, we’ve enhanced supporting document types to allow applicants and agents to upload payment receipts. Intake filtering. To give colleges greater flexibility for configuring intake filters to meet their specific recruitment and business goals, colleges can now create rules based on the applicant’s Country of Citizenship and Country of Residency. Extended Deposit and Payment information for pre-admits and offer letters. College Admissions staff now have the ability to add more detailed deposit and payment information for multiple terms, which can be included on the offer letter. This ensures both agents and applicants are informed of the financial commitments of attending the college for multiple academic years for a given program. Improved applicant profile access. College admissions officers now have the ability to send applicants an invitation which will grant applicants access to their applicant profile, application and offer letter documentation. This will allow applicants and agencies (if applicable) to make updates to an applicant profile, decrease wait times for applicants who need to meet conditions, and provide greater visibility into the application for applicants who are working with agents. New application filter – With the addition of a new agency filter on the List Applications page, managing applications between team members is now easier for college Admissions teams. 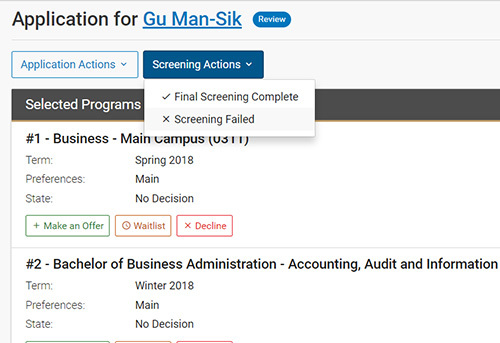 Decline program selections – Before an application is sent for review by a Credentials officer, Admissions officers now have the ability to decline some or all program selections as part of an enhanced screening process. New supporting document requirement – To help ensure complete applications, applicants and agents who indicate they already have a study permit will be required to submit the corresponding supporting document as proof of their status in Canada. New supporting document types – To better support international applicants, we’ve enhanced supporting document types to include documents from countries in Africa. New applicant profile messaging. To help improve the appearance of auto-generated offer letters, we’ve added messages and examples for applicants and agents on the desired format when completing the name and address fields. Names entered in all uppercase or lowercase letters will now automatically be changed to the correct mixed case format. Enhancements to offer letters and payment receipts. To prevent applicants and agents from accessing outdated offer letters and payment receipts, Admissions officers can now hide previously issued versions of these documents. This will ensure applicants have the most current documentation when applying for their study permit or a bank loan. Increased visibility of rules. 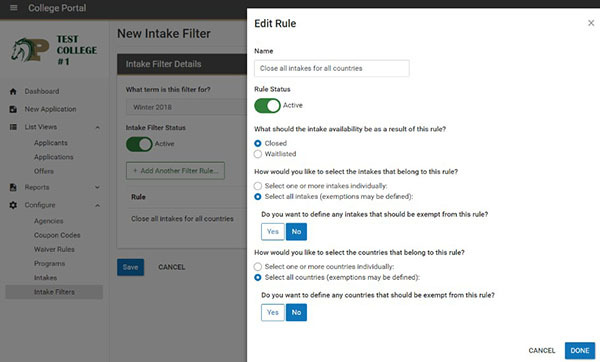 Appreciating the need to host multiple intake filters and have various dimensions to a rule, colleges now have the ability to preview a rule before it’s finalized, as well as view a summary of the rule after it’s created. This allows colleges to ensure the rule’s parameters are defined as expected, increasing confidence and improving the quality of the intake filters. New applicant view for rules. 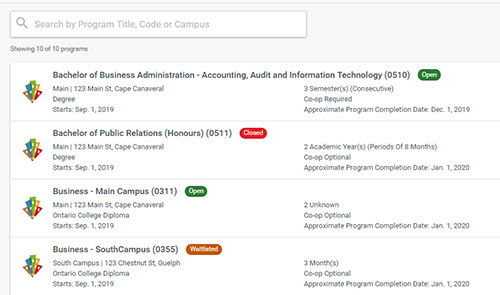 College administrators can now view a summary of all rules, with the ability to filter from the perspective of an applicant from a specific country and / or agency. Improved agency control. Colleges now have the ability to include or exclude one or more agencies from an intake rule, allowing advanced access for intakes to be enabled to top-performing agencies, while also ensuring agencies are excluded from rules where applicable to honour any exclusive agreements. Current student exemption. 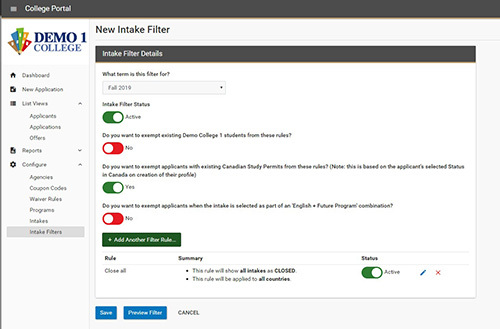 Intake filters can now be configured to exclude students with an existing study permit, allowing colleges to prioritize applicants already established in Canada who may have a greater probability of a study permit extension. Enhancements for English Proficiency plus a future program. Applicants who select the English Proficiency plus a future program combination can now be exempted from intake filters, allowing colleges to make future intakes available to those applicants only. Colleges will then have the ability to issue an offer for the same or similar intake when the applicant is ready to begin their full-time program selection. Open and close intakes. When setting multiple filters under a rule, colleges can now specify whether the rule’s impact will open or close an intake. To access any of these options features, please reach out to OCAS’ International Product Management team via service@ocas.ca. Program selection limits. To assist with management of international applications, this feature allows our college partners to set a maximum number of program selections available to applicants, between one and three. Refer a Friend – in which an existing student at the college referred the new applicant. Exchange Partnership School – in which the applicant is applying via one of the college’s exchange partner schools. Referral details are visible on the Application Details page. Enhanced measures for screening for applicant profile duplicates. In addition to our existing measures to check for duplicate applicants on a per college basis, a new field has been added to reduce the number of duplicate applications submitted to a college. 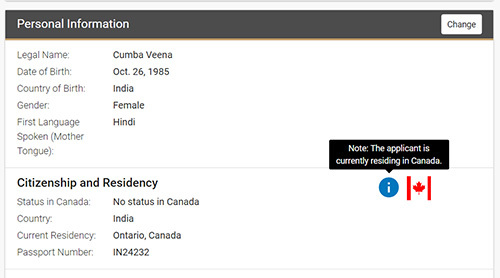 This new “passport ID” field is a requirement for applicants / agents creating a profile, and will trigger a warning message if an application is submitted for which there is already an existing passport ID. Applicant name, date of birth, and passport ID will now all be used collectively in checking for duplicate applications. Enhanced list of options for declining an applicant’s program selection. 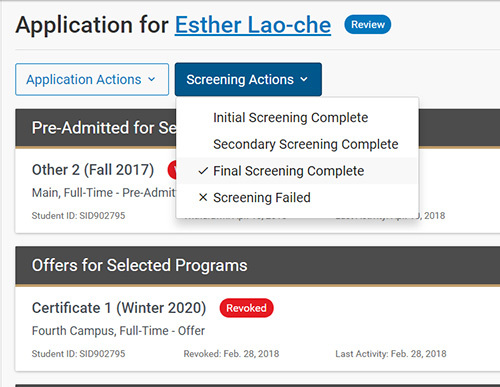 To provide more clarity and transparency, college users now have the ability to select from an enhanced dropdown list of reasons for declining an applicant’s program selection. The selected reason is then communicated via notification to the application creator (i.e. the agent or applicant). Re-assignment of applicants between international college representatives. Using the “effective country” field (available via the applicant’s profile), a new feature has been added to allow for re-assignment of an international applicant from one International College Representative to another. For example, in a case where an applicant has a country of citizenship of India but is living in Kenya, a college can use the new feature to assign the applicant to an International College Representative in Kenya by changing their “effective country” to Kenya. The same would apply for an applicant whose country of citizenship is China, but who is living in Canada – the applicant can be re-assigned to a Canadian-based college representative simply by setting their effective country to Canada. Enhancements to Information in letters of acceptance. To provide more detailed information to applicants, letters of acceptance will now include campus and program codes. New applicant profile messaging. To help improve the appearance of auto-generated offer letters, we’ve added a message for applicants, agents, and college users cautioning against the use of ALL CAPS when entering personal information. To access any of these optional features, please reach out to OCAS’ International Product Management team at service@ocas.ca. International applicant and intake filtering. To assist with management and flow of international applications, this feature allows our college partners to open / close / waitlist intakes to applicants from specific countries.